This Vintage 90’s O/H Anorak will take you back to the Vodafone Warriors’ early days when they were a fledgling team in the NRL. 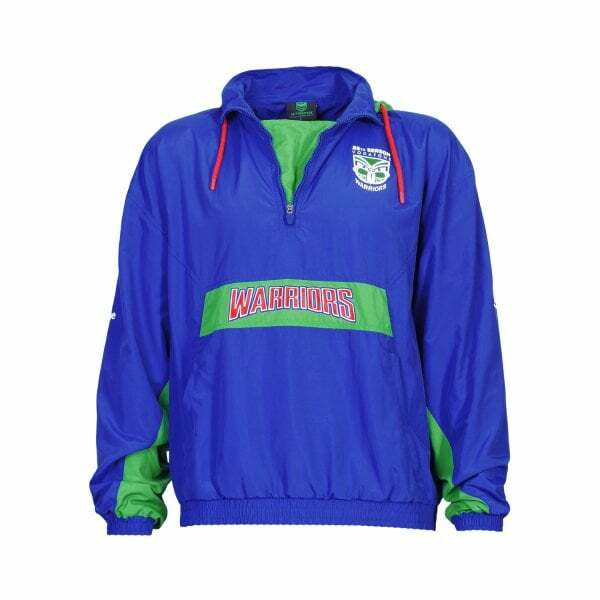 Complete with foundation colours and commemorative logo, it’s a blast from the past every serious supporter should own. Here’s a blast from the past that will turn heads and show your support for the Vodafone Warriors. Canterbury’s Vintage 90’s O/H Anorak is a fully lined over the head anorak with three quarter zip and storm guard down the front. It has classic drop shoulders, oversized sleeves and an elasticated hem band and cuffs and features the team’s 1995 foundation colours of blue, green, red and white. It also has a logo on the chest and a striking graphic on the back celebrating their 25th NRL season. One for every dedicated fan of New Zealand’s national NRL team and available in Canterbury’s 2019 Vodafone Warriors Supporters range.